Ten years ago, Gail Hinshaw of Worthington bought a 1967 Serro Scotty trailer for $100 that not only had a hole in the roof, but was “rotting,” she said with a chuckle. After a total refurbishment that included replacing the closet with a bathroom, she is proud to show off her Scotty and take visitors on a tour of the interior. That’s what she was busy doing Saturday at the second annual Tin Can Tourists Ohio rally open house that was held at the Colonial Campground and RV Park in Coshocton. “It’s all original, just different décor and it’s no longer rotting,” said Hinshaw, who used to live in West Lafayette. 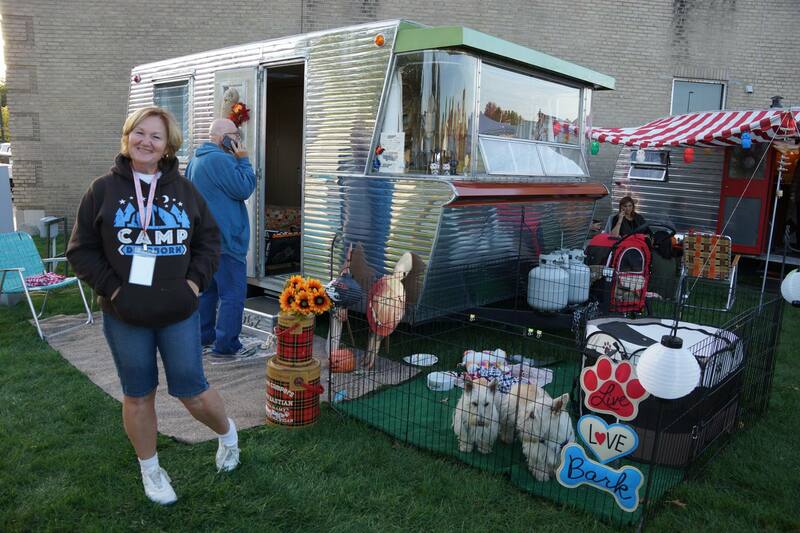 Hinshaw has been a member of the Tin Can Tourists international group since she bought her classic camper. The group lives up to its slogan “rolling history,” as its members take to the road with their vintage campers not just to pursue their love of camping, but preserve the history of the favorite outdoor pastime. Amy and Frank Garvin of Cincinnati purchased a 1967 Serro Scotty two months ago and visited Coshocton to check out the Tin Can Tourists. They stopped to visit Tin Can Tourist member Dawn Bastian of Goodrich, Michigan, who brought her 1962 Holiday House trailer and talked about their plans to fix up their Scotty and join the group. “We love camping any way and we like to save things,” said Amy, who said the nostalgic décor that many of the campers have brings back memories for her. “I think it also brings people together,” Frank Garvin said. Bastian agreed, and said that the vintage camping enthusiasts love to share their stories. The Tin Can Tourists came to town on Thursday and will stay through Sunday. They opened up their campers for visitors during Saturday’s open house, explained Ryan McPeek, owner of Colonial Campground. The theme for the open house was “Christmas in July,” with many of the campers decked out in vintage Christmas décor. “They love to show off their campers, and they love getting together,” he said. The event has grown significantly in one year, McPeek said, from eight classic campers last year to 25 this year. Many of the vintage camper owners fixed up their interiors with vintage items to add to the authenticity of the event, and some even brought their historic cars. 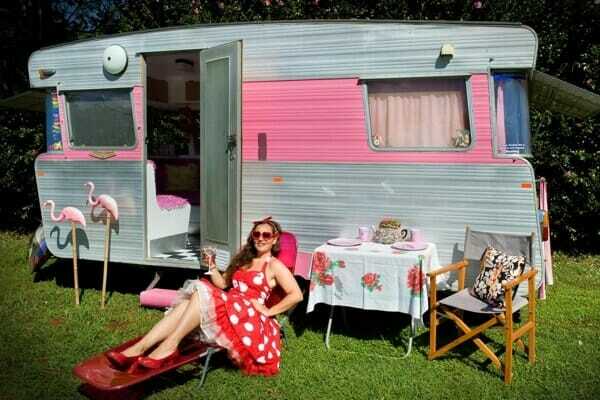 “The Tin Can Tourists preserve the history of camping. It’s a fun event,” McPeek said. Shawna Furlan of Buckeye Lake has been a member of the Tin Can Tourists for two years and came out to the event with her original 1962 Airstream Globe Trotter. “I grew up Airstreaming,” said Furlan, who inherited her Airstream from her mother. Today, she and her husband Bobby enjoy traveling with the group to share the history of the vintage campers and the joy of camping.